Twilight has loomed for decades. Rumors of the coming sun run across the city's dark alleys and corrupted courtyards. Impromptu festivals catch like wildfire as the denizens of the dark city usher in the Season of the Sun. You have precious few nights of perpetual moonlight remaining to secure your bloodline's grip on the great districts before the moon sets; because once the sun rises, all your deeds will come to light, and a new age will dawn on Hemloch. 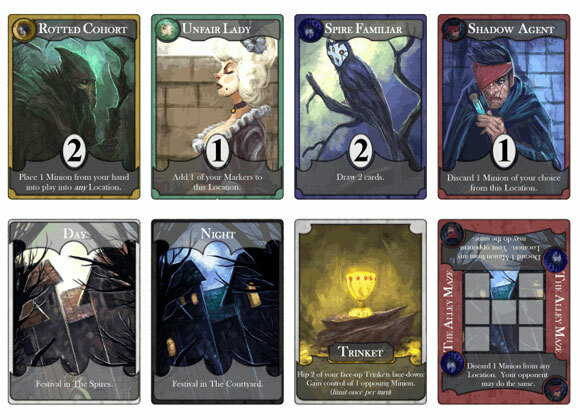 Hemloch, a card game for 2 players, has player accessing their own deck of Minions including minions from the city's largest 5 factions: The Darkened, The Ghouls, The Geared, The Alchemists, and The Courtesans. These minions are played into various Locations, representing powerful districts. Each Minion has a unique special ability, but also, each Location offers a Special Ability when specific Minions are played there, making for a wealth of various special abilities that a player can access. With the optional Drafting rules, players can create new Minion decks with each game. A wonderfully short and brutal cardgame for 2-4 players. I’ve never had a bad game and everyone I’ve played it with has enjoyed it, from my casual friends to my war-gaming friends. The only stipulation I have is the rules can be a bit vague, but a careful second read-over generally gets you the answer you need. The art is wonderful and the colours schemes add to the horror-themed world of Hemloch. Add a Review for "Hemloch"